Cradle head play a big role in taking picture. It can Control the camera Omni-directional angle to facilitate shooting at different angles. So, to maximize the range of the working distance and read the invisible ink marks, we develop this cradle head IR marked cards camera. This long distance used cradle head IR camera to see marked cards rotatable, so just with one cradle head infrared camera, you can see most of the game table in the poker room. In the long run that will decrease your cost in buy more fixed style marked cards cheating IR camera. You can pretend it as the spy camera or the cctv to watch out the condition of your room. IR lens using the latest optical design and special optical glass material technology, eliminate the focal plane shift of visible and near-infrared light, so that you can see the human eyes invisible ink marks. Normally, as for the hidden marks, if the customers do not have the special requirement, we will choose the marks we design, but they can also ask to mark the unique signs they need. 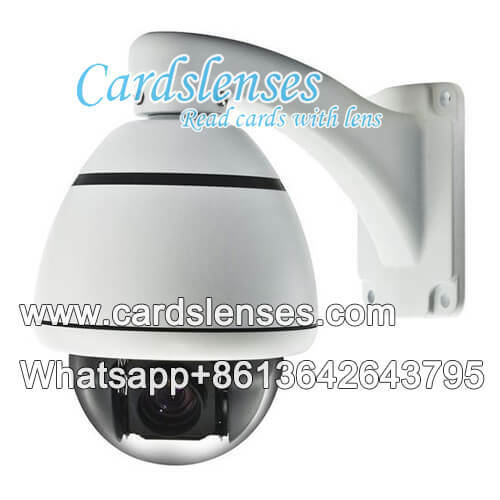 And for the working distance and working time of this cradle head cheat marks playing cards camera, we can adjust them according to your need.